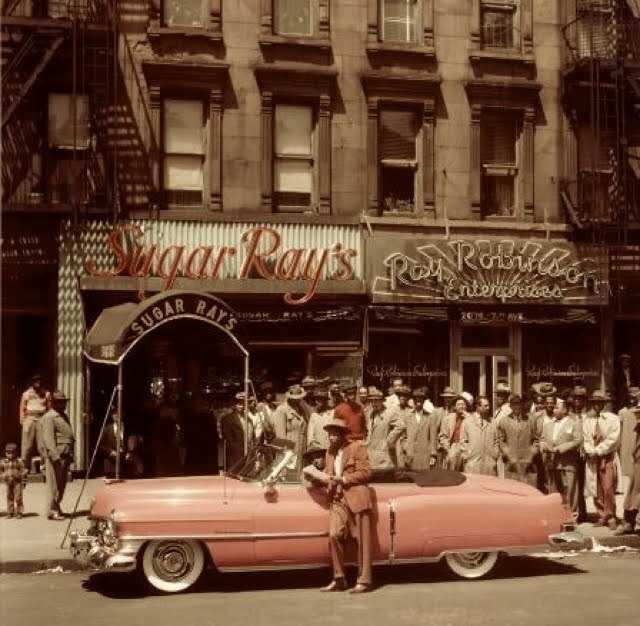 Sugar Ray Robinson was not only the world's most famous boxer in the 1940's and the 1950's, the athlete was also one of Harlem's most ostensible businessmen. The Harlem celebrity practically owned the block between 123rd Street and 124th Street on 7th Avenue's (today's ACP) west side of the street, right before the Hotel Theresa. The main shop of note was Sugar Ray's Restaurant and Bar (top photo) which the dapper showman posed in front of alongside his famous pink Cadillac for Life Magazine in 1950. Next door was Ray Robinson Enterprises which was his real estate business, alongside his wife's boutique called Edna May's Lingerie Shop, the Golden Glovers Barber Shop, and a beauty salon to complete the mix. Alas, today all is gone and even the block's buildings themselves have been replaced by government housing (lower photo). Nevertheless, if a new shop owner dresses up the nondescript building with some of the cool signage from the original stores, maybe a new franchise block can be found once more. 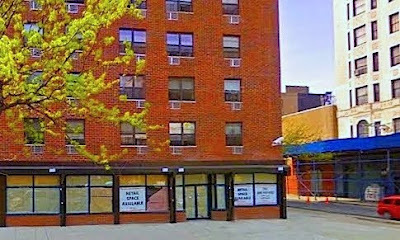 The closest subways to this area is the A,B,C,D or 2,3 at 125th Street. Click on top photo to enlarge. What was the name of the stuff that the men put on there hair to make it straight and wavy? This is was during the 50's and Ray Robinson's shop did it. Some used lye to "conk," but to put small waves in his hair, my father would apply a product called Pometex and a "stocking cap" overnight. I hope that helps.